Saint Francis university signee and Notre Dame senior Katie Detwiller with family members, coaches, and administrators at her signing ceremony Tuesday. 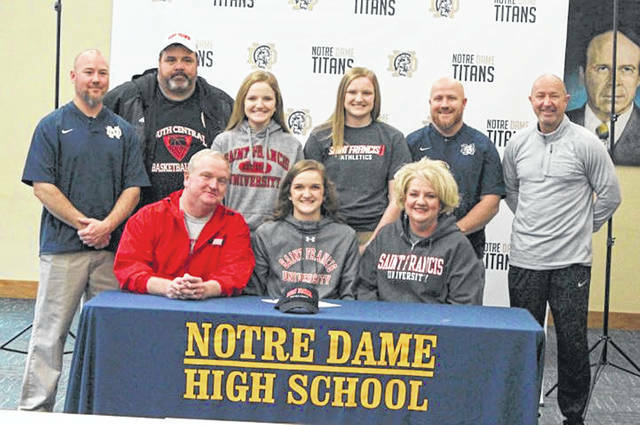 Tuesday morning, Notre Dame senior standout basketball and volleyball player, Katie Dettwiller, signed her letter of intent to play college basketball with division one Saint Francis University. Saint Francis is a four year Catholic liberal arts university located in Loretto, Pennsylvania and has an enrollment of an estimated 1700 undergraduate students. The Red Flash compete in the Northeastern Conference at the division one level alongside fellow universities such as Sacred Heart University, Robert Morris University, Mount St. Mary’s University, among others. When it came time to decide where would be her college of choice, Dettwiller said she kept her faith at the forefront of her decision. During her junior campaign, Dettwiller helped her Lady Titans team win the school’s first district championship alongside a perfect regular season and postseason record at 25-0 before falling to girls’ basketball powerhouse Waterford in the regional semifinals 49-30. In that season, Dettwiller averaged 14.7 points per game, 10.1 rebounds per game, and 4.9 blocks per game while also shooting 76% from the floor. The Lady Titans will be favorites in the SOC I again this season, and both Dettwiller and McKenzie are looking forward to their upcoming season which will begin next week.